High up on the moors between Wensleydale and Swaledale is a place I really like to spend time. It’s a great place to get away from the urban centres and stare out at the amazing views, listen to the wind, watch the clouds go by and feel good. But even here the lines between the built environment and the natural environment can be stark. We stoppped here for a little sustinance at the side of a small stream and the thousand yard stare was savagely interupted by the wall where the stream passes under the roadway. 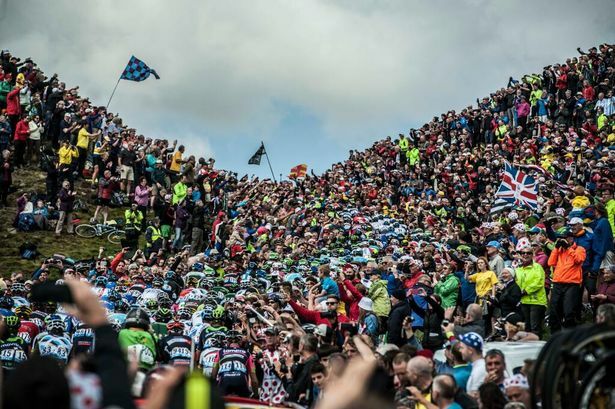 It wasn’t quite the peaceful solitude here though two years ago when the Tour de France started in Yorkshire when this place was a sea of humanity as you can see below in a picture from the Liverpool Echo taken by James Maloney. ← Getting back to it. Two opposites…so well shot by you.